Background: Mesoporous silica nanoparticles (MSNs) are emerging as one of the new and promising nanomaterials for biomedical applications, but enough investigation has not been done in the field of the biocompatibility of MSNs in vitro condition. Objective: The present study aims to investigate the toxicity of mesoporous silica nanoparticles in BM-MNCs and SHSY5Y Cell. Method: The synthesis of MSN was performed and it was characterized for its size by SEM and XRD. The cellular toxicity of MSN was investigated by MTT assay as well as LDH assay in BMMNCs and SHSY5Y Cell. Results: In this article, cellular toxicity of mesoporous silica has been targeted keeping in view the size, toxicity, dose administered and in vitro toxicity. In the present study, mesoporous silica was synthesized and characterized for its size via SEM and XRD as 123.05 nM. The antibacterial test via disc diffusion assay was performed and no significant antimicrobial effect was found at low dose i. e less than 150 uM. 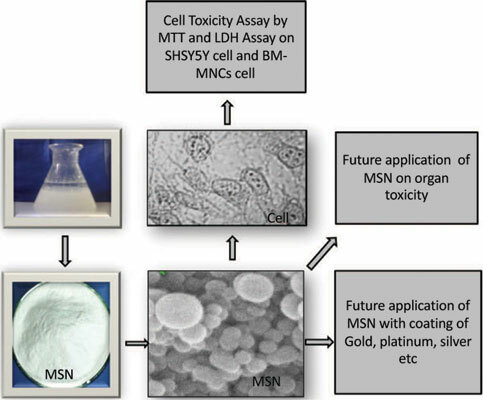 The in vitro toxicity of MSN in bone marrow mononuclear cells and SHSY5Y cell was investigated in a time and dose-dependent manner. These results also confirmed no significant toxic effect at a low dose while at the higher doses, toxicity was observed. Conclusion: Altogether, this article illuminates mesoporous silica as safe nanoparticle at low doses for drug delivery. The present finding will help researchers to develop and target MSN nanoparticlebased therapeutics for several applications in biological science. BM-MNCs, mesoporous silica nanoparticle, SHSY5Y, Cellular Toxicity, biomedical applications, SEM, XRD.